The Mohonk gardens are always spectacular. We love that they change the design each year, so every year they look entirely unique. We try to visit every month or so to see the changing display as it grows! 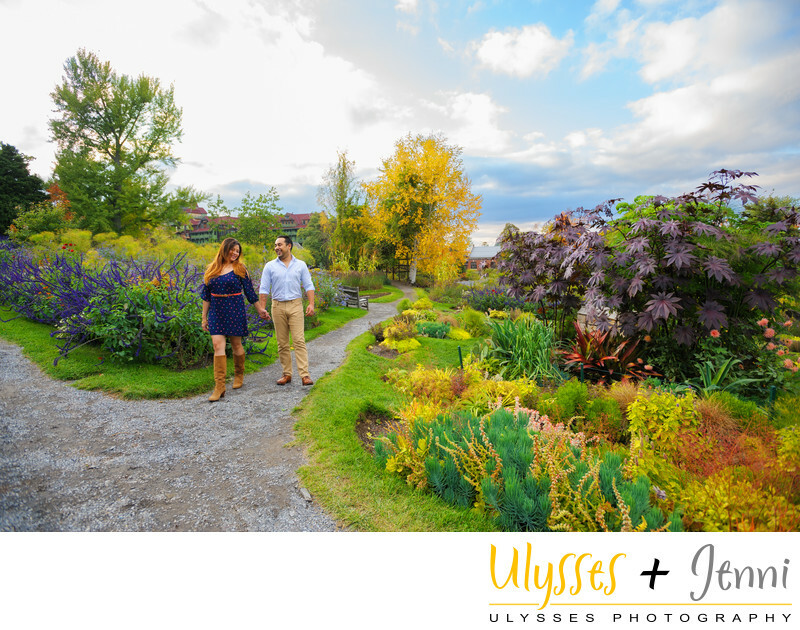 The gardens are the perfect place for engagement photos, and our couple here really enjoyed a casual stroll through them. You can't beat the reds, greens, yellows, purples, blues, and amazing textures and shapes. So romantic and so pretty! Their autumn engagement photo shoot featured gorgeous blue skies and puffy clouds. It was the most beautiful mid-October day. Before the photo shoot, Bernadette and Bill had lunch at Mohonk in the main dining room. They absolutely loved it, and it was a great start to their day trip at this gorgeous resort. Bernadette also made good use of the Mohonk Salon, where she got her hair and makeup done. It was so convenient for her to have this done right on the premises, and they did a fabulous job. Professional air and makeup makes such a difference on a photo shoot. Bright sunlight can make you look washed out if you don't have some makeup on, even if you think you normally like a more "natural" look. Don't be afraid of makeup - just use a great makeup artist who will bring out your best features and help you to look your absolute best. We loved exploring Mohonk with this couple, and these beautiful florals are just one reason. The views at this location are just incredible. Location: 1000 Mountain Rest Rd, New Paltz, NY 12561. Keywords: Autumn (99), Bernadette + Bill (15), engagement (282), engagement photos (78), fall (15), lake (21), leaves (27), Mohonk (48), Mohonk Lake (21), Mohonk Mountain House (69), sunset (135).